"I have a lot of good memories of Halloween parties and trick-or-treating in our neighborhood in Washington, Pennsylvania, where I grew up." Jesse Bear has a wonderful time getting ready for Halloween. He loves carving pumpkins and trying on costumes. But when it comes time for trick-or-treating, Jesse gets scared. 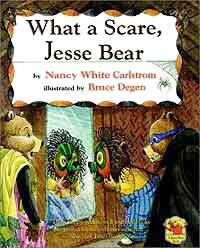 With his parents by his side, Jesse soon builds up the courage to put on his scary mask — and even plays a trick of his own!